We all know that the point of investing is to grow your savings. 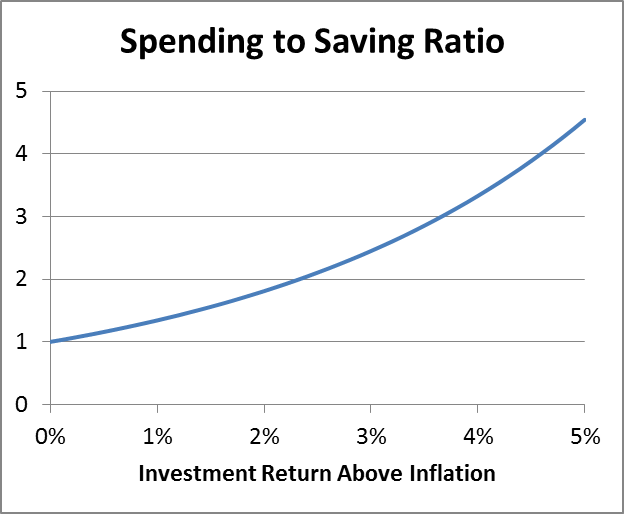 But how much benefit do we actually get from saving and investing well? Here I try to quantify this benefit. For any analysis of this kind to make sense, we have to think in terms of inflation-adjusted dollars. So, instead of talking about dollars, let’s talk about saving and spending baskets of goods. When the government comes up with inflation figures, they are basing them on the price of a standardized basket of goods. Imagine a hypothetical saver Sarah who begins saving at age 25. She saves some number of “baskets” per year, and she increases this number steadily until she is saving triple this amount per year by the time she is 50. The actual number of dollars she saves at age 50 will be more than triple what she saved at age 25, but the number of baskets of goods she could buy with the saved money triples. Sarah’s saving level then stays steady from age 50 to 65. Then she begins drawing her “baskets” steadily in retirement until she runs out of money at age 90. If Sarah has invested well, the total number of baskets she spends in retirement will be more than the amount she saved. But how much more will it be? This depends on the returns she got in her investments. The following chart shows how many baskets Sarah got to spend for each basket she saved. The horizontal axis shows Sarah’s return above inflation. So, if inflation averages 3% and her investments average 6%, Sarah beat inflation by 1.06/1.03-1=2.9%. To make sense of this chart, let’s start with a return above inflation of 0%. This means Sarah’s investments just covered inflation and nothing more. It makes sense that in this case, the number of baskets Sarah gets to spend will exactly match the number she saved. So the ratio of spending to saving is 1. However, for higher returns, things look better. Personally, I’m hoping to make 4% or 5% above inflation. I’m not counting on this, just hoping. If Sarah got this much, she’d get to spend between 3.3 and 4.5 baskets of goods for each basket she saved. This sounds like a very good deal. However, if Sarah owns balanced funds with MERs in the 2.5% range, she could easily end up with average returns of only 1% above inflation. In this case, Sarah would only get to spend 1.3 baskets for each basket she saved. This shows the importance of minimizing costs and avoiding behavioural mistakes that drag down your average returns. Of course, you have to save some money in the first place to get any benefit from investing. @Potato: Thanks. I strive for writing things that seem so simple in retrospect that people think they knew it all along. I'm sure there's lots of room for incorporating real-world complications. Another reason to educate oneself on the various investment options and make the best choice for you knowledge, risk tolerance, etc. Some people might actually be better off with mutuals if they can not take the time to manage their money. At least they will have saved something. @Anonymous: If you mean TD e-Series funds, I'm with you. But if you mean expensive mutual funds, I don't agree. It takes knowledge to manage money simply and well, but very little time is needed.